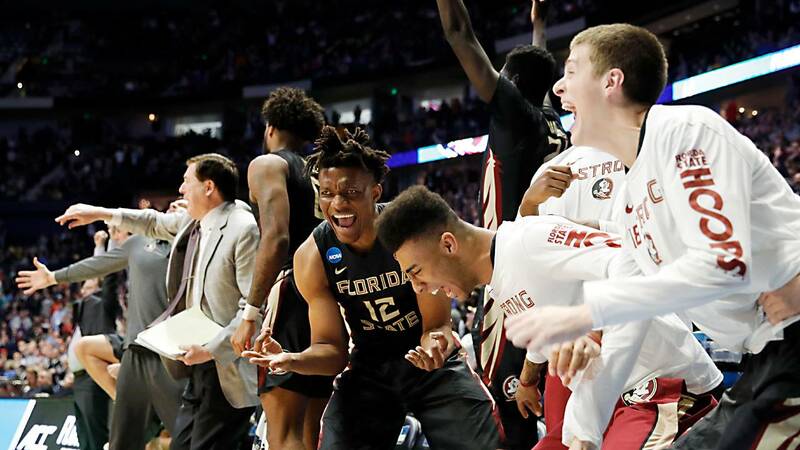 The Florida State Seminoles bench reacts against the Xavier Musketeers in the second round of the 2018 Men's NCAA Basketball Tournament in Nashville, Tennessee. NASHVILLE, Tenn. - The Florida State Seminoles are on their way to the NCAA Tournament's round of 16 for the first time since 2011 after upsetting top-seeded Xavier with a furious comeback. The Seminoles made Xavier the second No. 1 seed ousted in tournament's first weekend, sending the Musketeers out along with Virginia. Now Florida State (22-11) will play fourth-seeded Gonzaga on Thursday night in Los Angeles. Savoy also hit a pair of free throws with 21.6 seconds left putting Florida State up 73-70. Kerem Kanter shot an air ball from beyond the arc at the top of the key with 7 seconds to go for Xavier, and CJ Walker added a pair of free throws with 6.4 seconds remaining. Terance Mann picked off a long pass by Paul Scruggs off Xavier's inbound pass before running in front of Seminoles' fans to start the party. Xavier coach Chris Mack had four starters back from that team that wound up losing to Gonzaga in the Elite Eight, and Florida State coach Leonard Hamilton lost his top three scorers - two to the NBA Draft. The Musketeers didn't get the chance to run away this time around after they took a 12-point lead. They led 56-44 with 10:42 left, and a free throw by Trevon Bluiett gave them a 66-57 edge. But Xavier didn't score a field goal after Kanter's jumper with 3:56 left for a 68-66 lead. Mfiondu Kabengele scored his second straight bucket tying it up at 68 with 2:32 to go. Xavier: The Musketeers had been 23-1 when allowing less than 80 points. ... Macura fouled out with 2:06 to go, and Bluiett finished with just eight points and five turnovers. Xavier: Mack will have to replace Bluiett, Macura and Kanter.